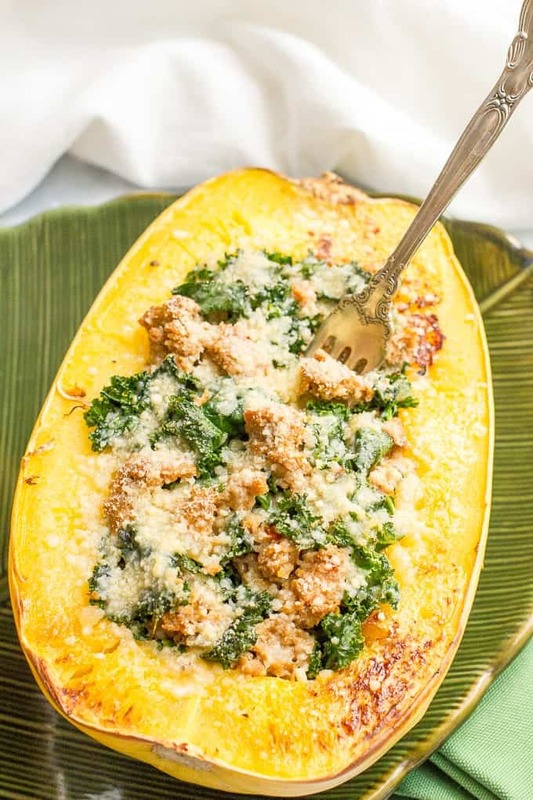 Stuffed spaghetti squash with sausage and kale is an easy 6-ingredient recipe for a delicious, hearty dinner! Hiya friends! How are you all doing? I had a little stomach bug earlier in the week — thank you, back-to-school germs — but am now mostly rested, recovered and hoping it doesn’t make the rounds in our house. I also had my first PTA meeting last night. I sometimes still feel like I’m just masquerading as an adult — like I don’t know what I’m doing and don’t belong, while everyone else has their sh** together — but I know we’re all just doing our best and hobbling along. Right? Right?! Please just speak to me in soft tones and pat my head. Anyway, can we talk squash? And specifically spaghetti squash. It’s a fruit. Did you already know that? How did I not? I guess since it’s prepared as a vegetable- baked, roasted or steamed – I just thought it was. Nope. It’s a fruit. So is butternut squash. And pretty much every other winter squash. Anyway, I love me some spaghetti squash, whatever food group it might fall into. 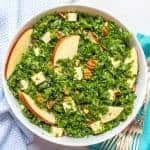 It’s light but rich and it makes a seriously fantastic low-calorie, nutrient-dense alternative to pasta. Plus it’s just crazy to see that hard squash yield those long, thin strands. A fun food for sure! 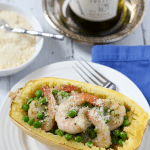 My spaghetti squash with pesto, peas and shrimp is a great light all-in-one meal. And I also love my 4-ingredient spaghetti squash with pesto chicken for an easy, healthy meal. 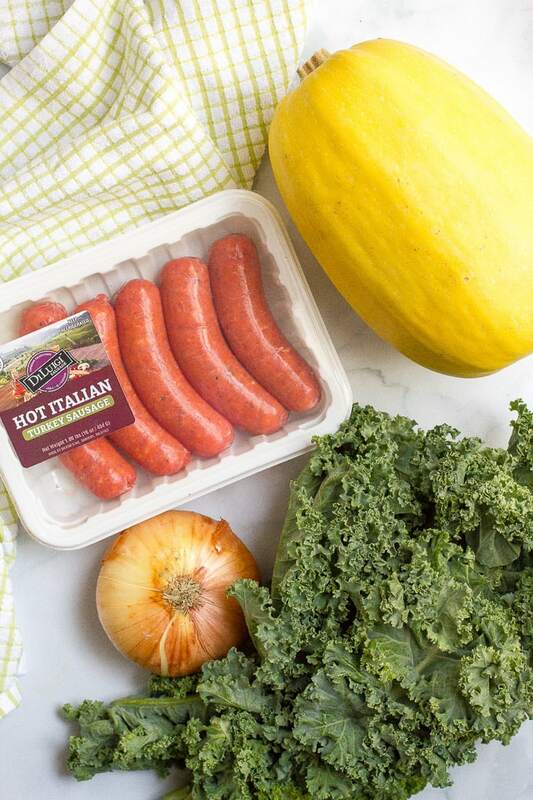 Today’s stuffed spaghetti squash with sausage and kale is still healthy and fairly light, but it’s also a nod to the coming cold weather and the need for all things comfort food. And it’s only 6 ingredients (plus olive oil, salt and pepper)! 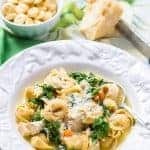 I use hot Italian turkey sausage for a little kick. 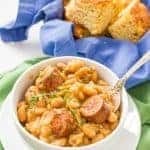 You can substitute mild turkey sausage or use pork sausage or chorizo. I’m lazy so I just tear the kale leaves as I’m taking the stem off and washing them. That’s good enough for this recipe, but you could certainly chop them more finely if you’d like smaller pieces. I like onion and the flavor it adds but you could reduce or omit it if you prefer not to have onion in the final meal. 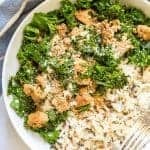 You can pull the strands of your spaghetti squash after it’s cooked and then add the sausage and kale stuffing mixture, or you can just pile it on top and let everyone scrape their own spaghetti squash as they’re eating. You can make the spaghetti squash and the stuffing mixture ahead of time and store them separately in the refrigerator. Take everything out while you preheat the oven to let it come to room temperature a bit then cook at 375 for 20 minutes or until heated through. I prep the squash and get it roasting first. While it’s in the oven, I start browning the sausage. While the sausage is cooking, I wash and prep my kale so it’s ready to go. 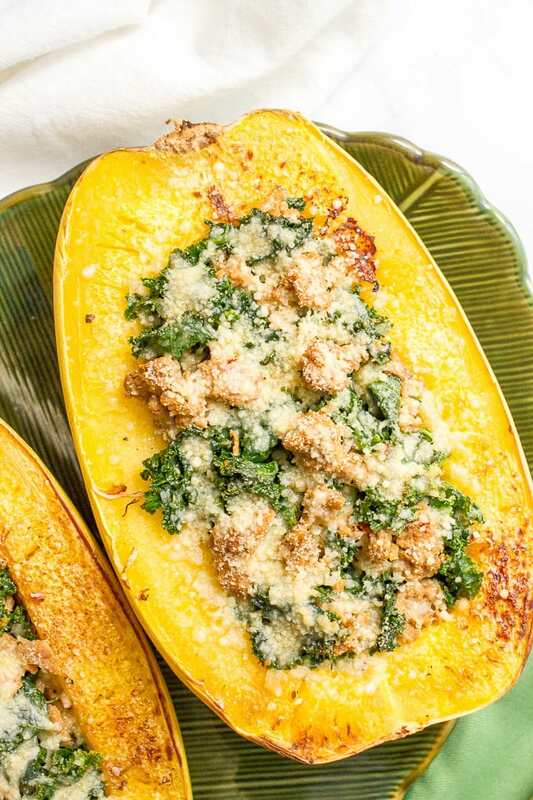 Get to stuffing your squash and enjoy! 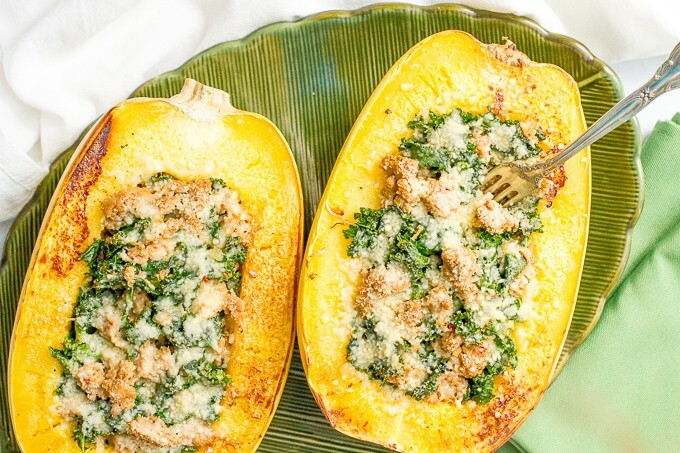 Stuffed spaghetti squash with sausage and kale is an easy 6-ingredient recipe! Preheat oven to 400. Line a rimmed baking sheet with aluminum foil and spray with cooking spray. Heat olive oil in a large skillet over medium heat. Add onion and saute for 2-3 minutes, until tender. Add garlic and saute another 30 seconds. Add sausage and cook until well browned on both sides and cooked through, breaking it up with your spatula as it cooks, about 7-8 minutes total. Next, add the kale to the pan and stir to combine and help it wilt down. Season with 1/4 teaspoon salt and 1/8 teaspoon black pepper. 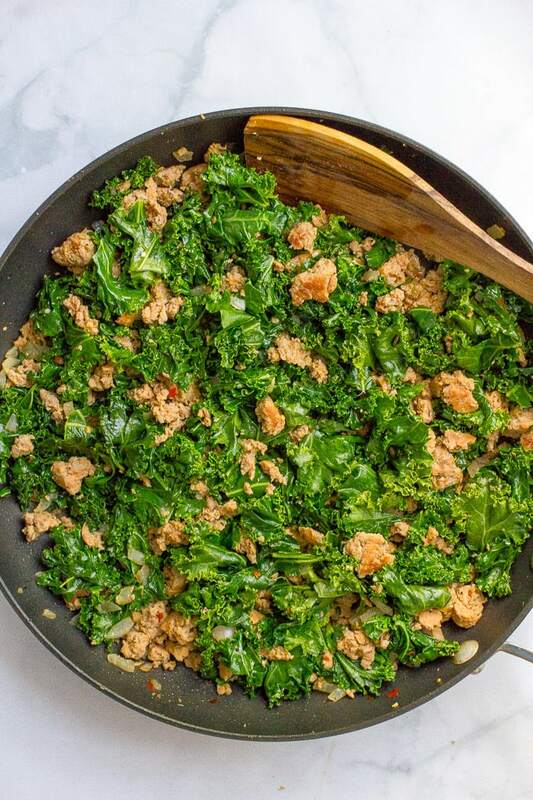 Once kale is wilted, turn off heat and set the pan aside. 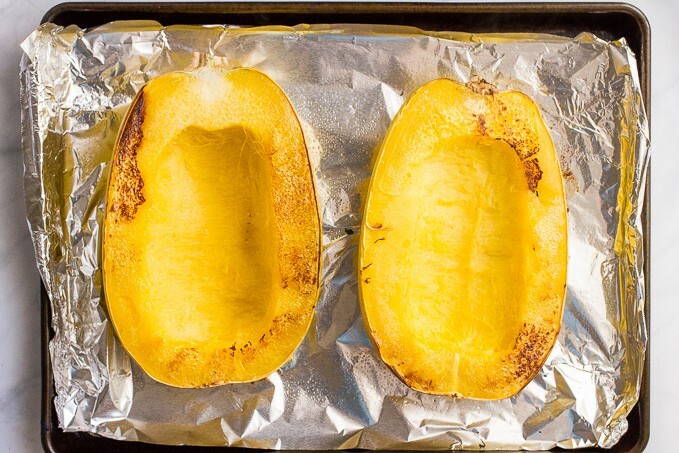 When the spaghetti squash is cooked, season the inside of each squash with the remaining salt and black pepper. 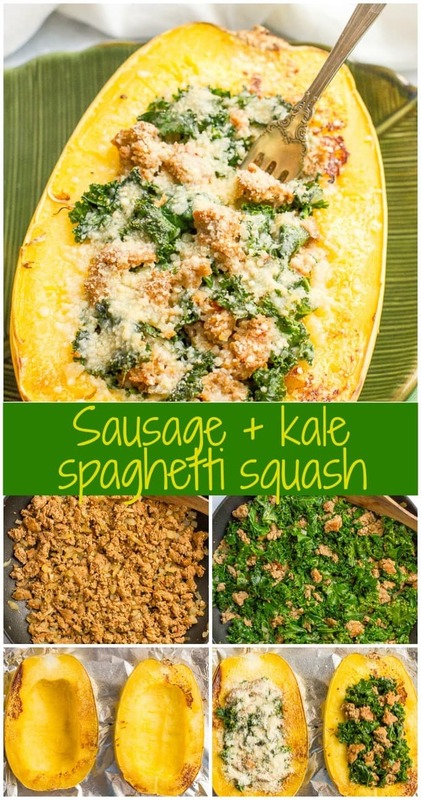 You can either use a fork to pull out the strands of each squash first or you can add the kale and sausage stuffing right on top. 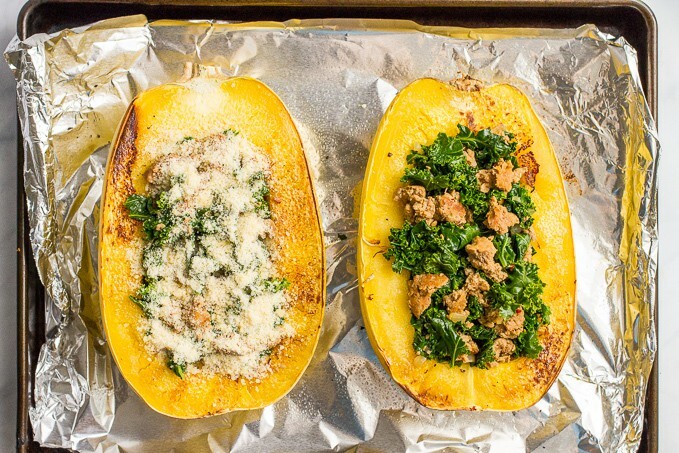 Sprinkle each stuffed spaghetti squash with 2 tablespoons of Parmesan cheese. Return the spaghetti squash to the oven at 400 for about 5-7 minutes to melt the cheese and get everything warmed through. 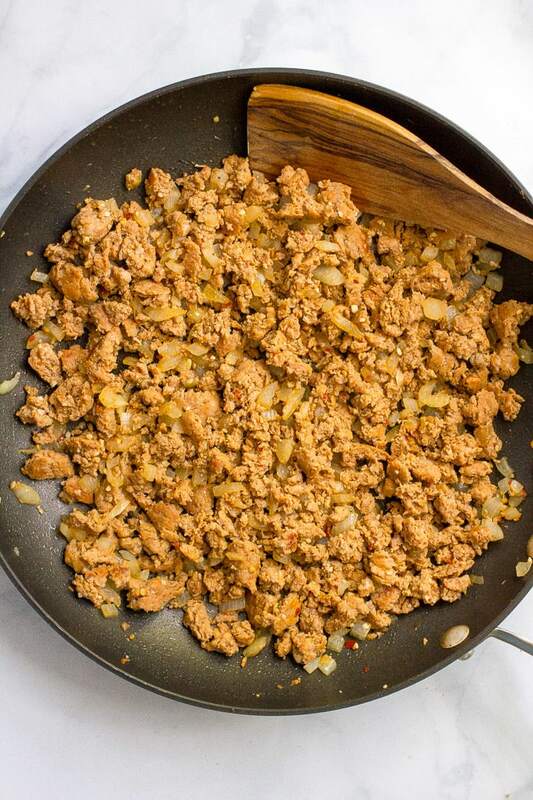 You can substitute mild turkey sausage or use pork sausage or chorizo. I tear the kale leaves as I’m taking the stem off and washing them. That’s good enough for this recipe, but you could certainly chop them more finely if you’d like smaller pieces. You can make the spaghetti squash and the stuffing mixture ahead of time and store them separately in the refrigerator. Take everything out while you preheat the oven to let it come to room temperature a bit then cook at 350 for 20 minutes, or until heated through. 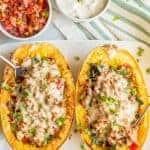 I love spaghetti squash and this sounds and looks wonderful! Pinning! Thanks so much Diane! I hope you give it a try! Glad you are starting to feel better, Kathryn! Bugs and colds are certainly common around this time of year! I think that you have your s*** together! But, I do know what you mean!! I sometimes feel that way too and feel that sometimes I have no clue what I’m doing and everyone else is so organized and composed. I guess we all feel like that from time to time, hey? You got this, girl 😉 ! Don’t you just love how they are your whole meal!? Plate, food, easy clean up, haha! 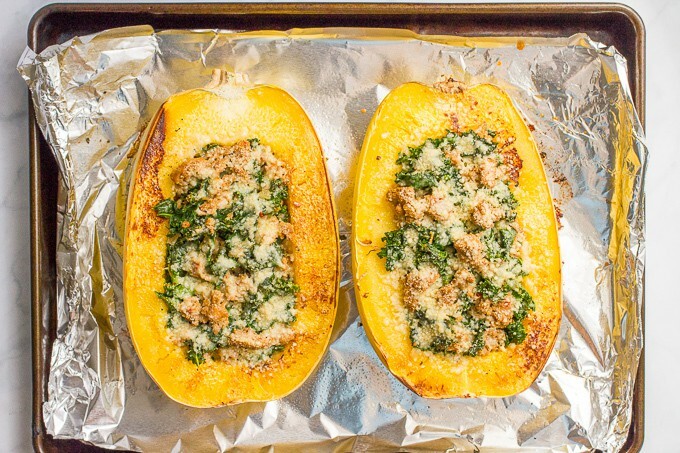 Spaghetti squash boats are always a fun dinner base! All the yummy fall food helps make the seasonal transition a little easier I think! Hope you do try this Kelli! Oh no, so sorry you got a stomach bug, but SO glad you are feeling better! I’ll keep my fingers crossed it doesn’t make the rounds in your family! I feel like I probably learned squash was a fruit in culinary school, but I totally chose to forget it. Oops?! So thanks for the reminder!! lol. I agree with you, spaghetti squash is SUCH a fun food! And I happen to seriously LOVE it! Obviously you can guess how I feel about this stuffed squash – LOOOOOVE! I am swooning over how hearty, yet light this dish is! Absolutely perfect for fall! Cheers, friend! So far, everyone else is A-OK! And yay for squash season! Hope you have a wonderful friend Cheyanne! What a great recipe here! I love the fall combos! This would be perfect for Thanksgiving, too! Spaghetti squash are one of my favorite things about fall and this recipe is no exception – it looks lip-smacking good! I’m glad you’re feeling better. I know it’s only a matter of time before I get sick, now that classes are back in session and I’m teaching four days a week. Hopefully veggie-packed recipes like these will help keep us both healthy! Fingers crossed for no yucky germs for you! And yes – let’s fuel up with all the yummy, good-for-us foods to keep healthy!! This recipe sounds great. I may try it with butternut squash, pork sausage and spinach as a variation if I don’t see spaghetti squash at produce stand. That sounds like a delicious combination as well, Joanne! I used hot Italian turkey sausage found at my local grocery store but, as noted above, you can substitute mild turkey sausage or pork sausage. And yes you should remove it from its casing to saute it for this recipe. Hope you try it!